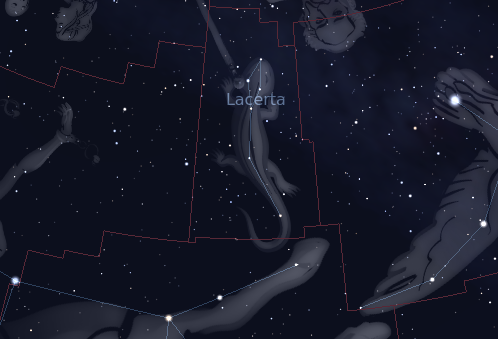 The constellation Lacerta. Roll mouse over to see labels. Lacerta is a small northern constellation which appears highest in the midnight sky in the months around August. It was introduced by the Polish astronomer Johannes Hevelius in 1690, filling an area of sky between Cygnus and Andromeda which lacks any bright stars. Lacerta represents a lizard, though it only contains one star brighter than fourth magnitude. It is home to the open clusters NGC 7243 and NGC 7209, as well as the variable object BL Lac, the prototypical example of a blazar. Varying between magnitude 14 and 17, however, BL Lac is extremely faint and can only been seen through the largest amateur telescopes. Lacerta contains the following Caldwell object: C16. 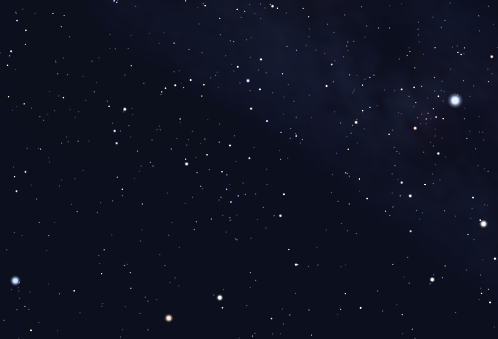 The following constellations neighbor Lacerta: Andromeda, Cassiopeia, Cepheus, Cygnus, Pegasus.